LiveCode LessonsData GridLiveCode Data Grid Working With Data Grids (Forms & Tables)How Do I Get Aggregate Values for Columns? 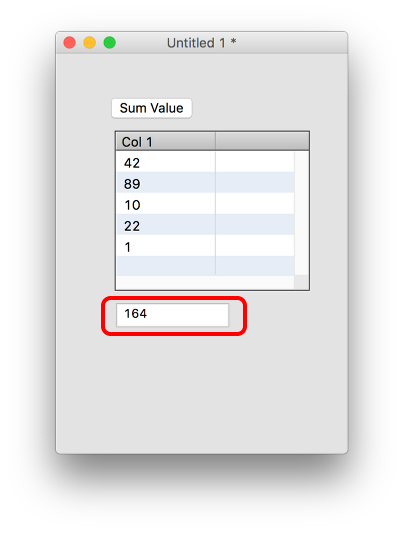 This lesson will show you how to add a custom property to a data grid that returns the aggregate value of a column. Usually this would be used with data grid tables but works equally as well with data grid forms. The simplest way to calculate aggregate values is to add a getProp handler to your data grid script. In this example I've defined a custom property called uSumOfColumn (1). You can pass in a column name (2) and the sum of all rows of that column will be returned (3). Here is an example of using the custom property. 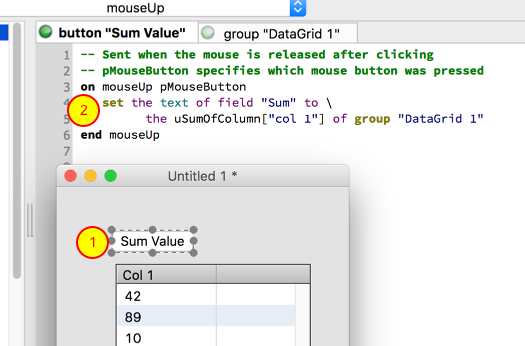 When clicking on the button (1) the text of another field is set to the uSumOfColumn custom property (2). Here the result has been put into the "Sum" field. Prev: How Can I See What The Data Grid's Internal Array Currently Looks Like? Next: How Do I Determine If the Data Grid Has Focus?